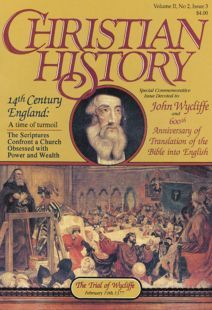 Wycliffe had been summoned to Rome by Pope Urban VI. Using Wycliffe’s poor health as an excuse, the king blocked the summons and Wycliffe wrote the following letter to the Pope. It was written just months before Wycliffe’s death on New Year’s Eve, 1384. “I am happy to reveal fully to anyone and especially to the Roman pontiff the faith I hold, for I suppose if it is orthodox, he will graciously confirm this faith and if it be erroneous he will correct it. But I submit that the gospel of Christ is the body of the law of God, that Christ, indeed, who directly gave this gospel, I believe to be true God and true man, and in this the law of the gospel excels all other parts of Scripture. Again I submit that the Roman pontiff, inasmuch as he is Christ’s highest vicar on earth, is among pilgrims most bound to this law of the gospel. For the majority of Christ’s disciples are not judged according to worldly greatness, but according to the imitation of Christ in their moral life. Again, from out this heart of the Lord’s law I plainly conclude that Christ was the poorest of men during the time of his pilgrimage and that he eschewed all worldly dominion. This is clear from the faith of the gospel, Matthew 8 and 2 Corinthians 8. From all this I deduce that never should any of the faithful imitate the pope himself nor any of the saints except insofar as he may have imitated the Lord Jesus Christ. For Peter, Paul, and the sons of Zebedee, by seeking worldly dignity, brought that sort of imitation into disrepute, so that they are not to be imitated in those errors. From this I infer, as a counsel, that the pope should leave temporal dominion to the secular arm, and to this he should effectually exhort his clergy. For in such wise did Christ have signified through his apostles. Some titles to help you research Wycliffe and his times.